When it comes to CBD – especially for new users who are trying it for the first time – convenience and discretion are often up there on the list of priorities. That’s where CBD Cartridges come in, as they are among the most convenient ways a person can take their CBD; safely, stealthily and at any time or place. The issue people have with replacement CBD Cartridges is that they aren’t always completely clear about the contents inside and that can have a knock-on effect on the whole experience. Where vaping CBD is concerned, there are a number of different factors one needs to take into account, including quality, CBD concentration, safety and of course price. When it comes to choosing the best CBD Cartridges – especially for those wanting to buy CBD online – it’s worth spending some time doing due diligence to locate the perfect cartridge that meets your needs. The first factors to consider are quality and purity. Before buying any CBD Cartridge online you need to be sure that it is made from pure and organic CBD Oil. Then there are the carrier liquids to consider as you’ll want to steer clear of products that contain potentially toxic or harmful substances. The next thing to take into account is the strength and overall potency of the CBD Cartridge you opt for. This is revealed by looking at the total Milligram count of CBD per cartridge; the higher the count, the stronger the effects. But then there’s always the price to consider and most people want to get the best bang for their hard-earned buck, especially those considering using CBD on a long-term basis. Fortunately, the three great products we have for you below offer the best-quality CBD anywhere on the market as well as the most sensible value for money options and some great sales. When it comes to buying CBD Cartridges online, CBDistillery, Savage, and VapeBright are some of the most respected brands out there and their CBD Cartridges are another fantastic addition to their growing arsenal of finest-quality CBD. 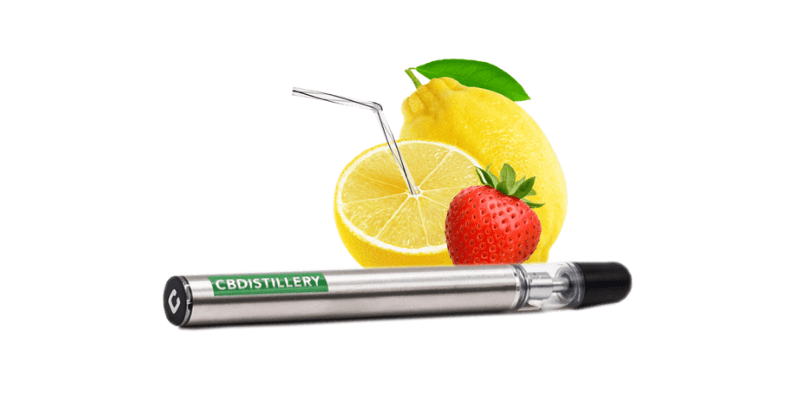 CBDistillery’s 200mg Strawberry Lemonade Vape Cartridge was recently upgraded by the creators who invested time and money in the ultimate vape technology to bring the finest results to their customers. Their first step was to add their unique CCELL vape technology to the already impressive mix. They claim that CCELL is the best way to vape CBD and that it offers the best and most consistent results of any atomizer. Due to heating to a higher temperature, this proprietary CCELL technology heats even the thickest of CBD Oils effortlessly. There’s also CBDistillery’s best-quality all-natural cutting agent. This means that you are getting the purest and most effective CBD vaping experience without any of the potential nasties contained in some lower-grade CBD Cartridges. CBDistillery uses only the best Tec Temper oil to carry the high-grade CBD Oil inside the cartridge. They argue that Tec Temper oil is superior and purer than other cutting agents often used, including MCT oil. Tec Temper oil is totally natural, organic and is also food grade and recognized as safe by the FDA. But there’s even more goodness packed inside this amazing product and that includes a delicious strawberry lemonade flavor. The CBDistillery CBD Vape Cartridge 200mg also includes a specially formulated blend of terpenes and antioxidants which all add up to a smoother, more satisfying vape experience overall. The fact that the CBDistillery vape cartridge is Colorado grown, pesticide-free, NON-GMO and third-party tested makes it an obvious choice for anyone interested in one of the most solid CBD Cartridges on the market. Their products are all expertly crafted in an ISO Certified Facility for guaranteed consistency, and their vape cartridges are 100% free of PG and VG. Savage CBD is a name that many people in the world of CBD trust and love. Their whole mission statement and goal is to help people to “obtain freedom and happiness in their lives,” according to their website, and they are fulfilling that mission well already by bringing some of the best CBD products on the market to the general public and those needing a long-term CBD solution for their medical issue or ailment. Savage CBD is all about restoring balance and wellbeing to the lives of people who deserve and need it. Their uniquely blended 500mg Pineapple Blast CBD Cartridge is derived from only the best hemp in the world, while the yummy tropical pineapple taste in the background is just a bonus for many. Savage CBD is a company that really understands CBD and is in tune with the needs of people who suffer from chronic pain, skin conditions, insomnia and a whole range of other medical issues. The dedicated 12 person team over at Savage have all had friends and family who have seen the numerous benefits of CBD in their lives. They understand the importance of bringing the best quality CBD on the planet to the people who need it most. 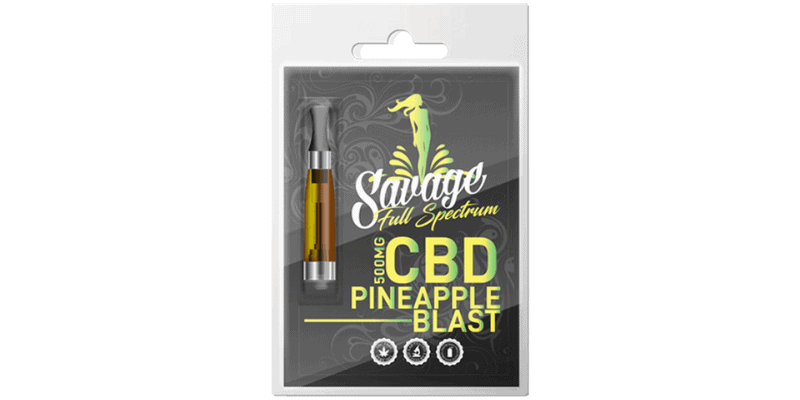 The Savage CBD Full Spectrum 500mg Vape Cartridge contains naturally occurring Terpenes as well as a serious punch of CBD with every hit. It is recommended for people who need immediate and strong relief from their symptoms. They note that this product is best used with a pen style battery that is suitable and that has airflow built in. Low wattage is also suggested as the way to enjoy this product in the most economical and effective way possible. Those in the know will tell you that VapeBright is a force to be reckoned with when it comes to the world of best-quality CBD. Having been in the business for many years, offering their unique products to people around the world, their chief chemist, Ben Smith, found a unique way to formulate CBD into Thrive, the company’s first product. 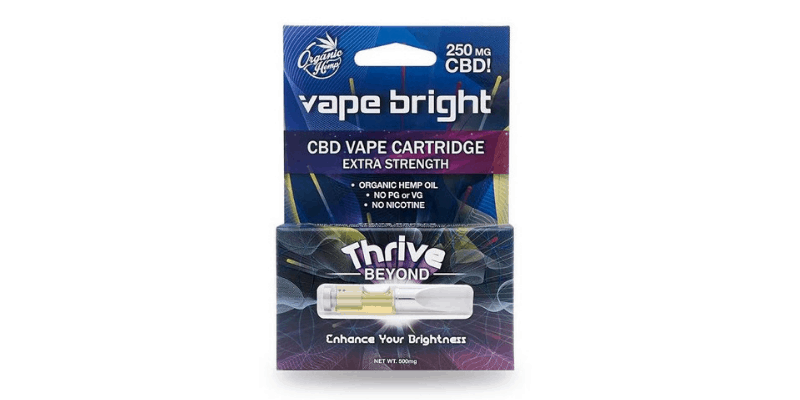 VapeBright’s Thrive Beyond 250mg CBD Cartridge contains an extra-potent formula, designed specifically to push the limits of how much top-shelf CBD can be packed into one tiny cartridge. With 250mg of CBD per cartridge, including great-tasting pure CBD Oil with zero PG or VG, the Beyond Thrive Vape Cartridge is one of the easiest, most convenient and cost-effective ways to take your CBD. Each serving packs a 10mg punch of CBD; up to 15 times the amount of CBD in many other similar products on the market. 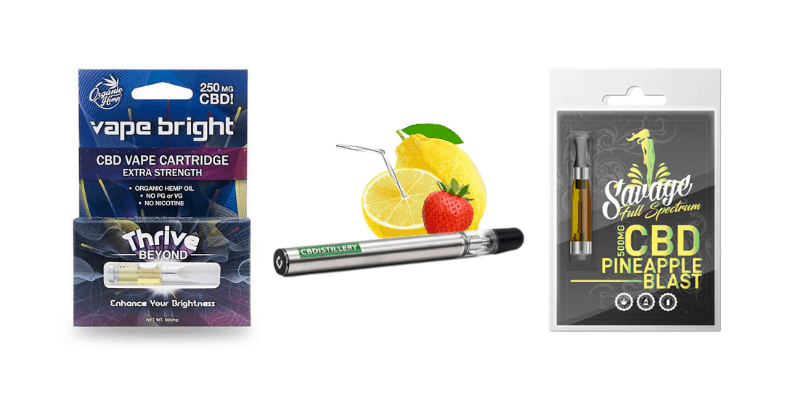 Whether you’re new to the wonderful world of CBD or an old-timer, The VapeBright 250mg Cartridge is a great option if you need fast and effective relief from pain or insomnia. It’s as easy as opening the box, attaching the cartridge to your battery and puffing away. Many people say they feel immediate relief from this vape cartridge, as well as a sense of calmness and wellbeing. With all the different CBD products available on the internet today, it can be tricky to choose the right product for you. When you buy CBD online always make sure you are purchasing your products from a reputable vendor and one with a proven track record of great quality and solid customer service. Bear in mind that companies like CBDistillery, Savage CBD and VapeBright have thousands of satisfied customers around the world as well as some rave reviews.